Do you have to speak to promote your business? SpeakingSuccess is a communication skills training company that works with franchisors to help them grow. Communication skills are vital to your success as a franchisor (or as a franchisee), whether you choose to grow your business by doing presentations, pitches or one-to-one sales. Celia Delaney has distilled over twenty years of teaching influencing, speaking and sales to create four ‘pillars’ of speaking success, known as The iPersuade Principles: iPrepare, iPresent, iPromote, iPersuade. Do you know how to prepare to speak? Learn how to prepare for different personality types, understand your own style and overcome any negative beliefs or resistance you may have to speaking and sales. Learn how to be a more engaging speaker. If you are not using speaking as a marketing tool, you are crazy! It’s one of the best ways to promote your business and a really vital tool if you are the MD or CEO of your business or you have responsibility for business development. Speed up your sales by learning how to sell 1-2-many instead of just 1-2-1. This 5-step sales conversation is geared towards speaking to groups, but applies just as well to your sales conversations day-to-day. Become a master influencer. Apply the lessons from the three other pillars to 1-2-1 sales, networking, and speaking more strategically and more often. These principles are taught through master classes for groups of 6 people and through books, online courses and individual coaching. You can also book Celia Delaney to speak at your conference or MC your award ceremony. 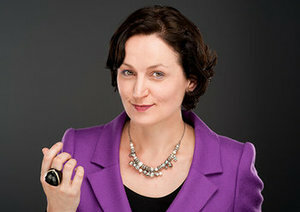 Celia’s topics are speaking skills, persuasion and humour and she is amusing, engaging and refreshingly original. As a trained actress and musical comedian, she often sings during her keynotes…which everyone loves. Honestly. "We have worked with Celia for several years now and her involvement in the franchise sector has added huge value to a number of our clients, giving them the confidence and the tools they need to get out and promote their businesses through public speaking. In my opinion, she is the best placed speaker trainer in the U.K. to work with franchisors to help them grow." To enquire about working with SpeakingSuccess, please submit the form below.